My order from Apple has two parts. Yesterday, I posted FEDEX tracking information for the first. 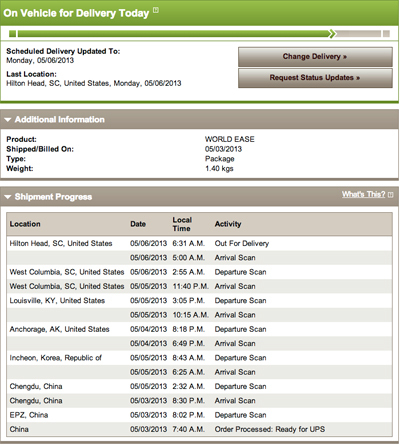 Notice that it left China on Friday and is now out for delivery to our house near Hilton Head. By the way, the FEDEX package from yesterday’s post just arrived. Have it in stock for customers to feel and play with. This includes accessories. Provide a lagniappe. Even if you have to order it for them, give them something extra, something they can take home, in their hands, today. Sell the whole experience: Provide free coffee (most places won’t let you give out free wine), keep the shop clean, ensure that everybody’s enthusiastic and having fun, and if you do screw up on something, fess up and make it right (screw-ups are your best opportunities to build customer relationships). If you’re the owner, get out on the floor, introduce yourself and mix it up with the customers. If lines get long at checkout (you should wish) lend a hand. This entry was posted in Boyd's Theories, Business Strategy, Latest News. Bookmark the permalink. In case you’re wondering, the UPS package I was tracking came about half an hour later, at around 10:30 am. The notification e-mail sent by Apple when it shipped had predicted it would deliver on Thursday, May 9th.